Chief Minister to King Louis XIII, Cardinal Richelieu was the architect of a new France in the 17th century, and the force behind the nation's rise as a European power. One of the first statesmen to clearly understand the necessity of a balance of powers, he was one of the early realist politicians, practicing in the wake of Niccolo Machiavelli. (A notable advocate of realpolitik in our own time, Henry Kissinger, credits Richelieu with introducing a modern approach to international relations). Forging a nation-state amidst the swirl of unruly, grasping nobles, widespread corruption, wars of religion, and an ambitious Habsburg empire, Richelieu's hands were full. Serving his king, however, and mastering the politics of absolute power provided Richelieu with his greatest challenge and ultimately determined his legacy to France and to all those who practice statecraft. Jean-Vincent Blanchard's rich and insightful new biography brings Richelieu fully to life, at court, on the battlefield, at times cruel and ruthless, always devoted to creating a lasting central authority vested in the power of monarchy, a power essential to the hegemony of France on the European stage for the next two centuries. 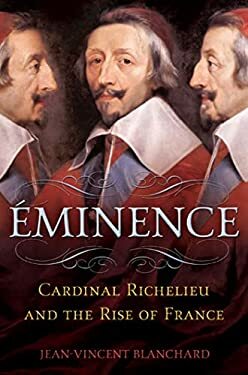 Especially interesting to contemporary readers will be Richelieu's careful understanding of politics as spectacle; much of what he accomplished was promoted strategically through the arts, through a "style," or romance of power. Richelieu's story offers us a keener understanding of the dark arts of politics.